The historic maps on PhilaPlace were made available by the Greater Philadelphia GeoHistory Network thanks to the generosity of our friends at the Free Library of Philadelphia, the Athenaeum of Philadelphia, and Matthew Ainslie, a private researcher and collector. 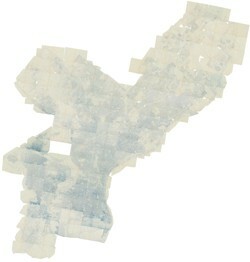 Digital mosaics of the individual sections of each of the following maps were created and aligned to actual geography and integrated into the Google Maps viewer. In any screenshots or references to the maps, please cite both the GeoHistory Network and the original source listed below. The original images, as well as the digital mosiac, may be viewed by clicking the title of any of the resources. Complete in One Volume. From actual surveys and official plans. Shows racial concentrations, location ratings, age, real estate sales prices and industrials. 2 sheets. Land-Use Zoning Project No. 18313. 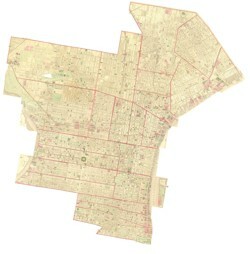 Survey showing actual zoning use for each parcel of land in the city. Follows an indentical survey completed in 1942, and earlier surveys at a smaller scale.